Wayne shares tips on the benefits of purging and repurposing things in the kitchen. 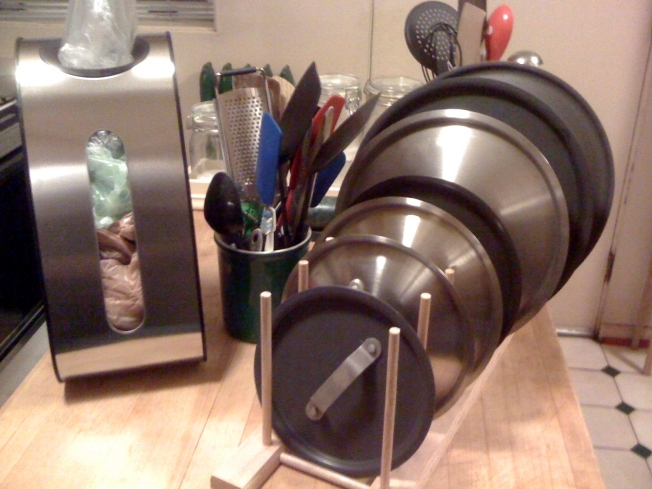 Wayne's Weekend: Organization your kitchen will make food preparation more efficient. From plastic bags to disposable containers, many of us tend to just stockpile kitchen equipment, disposable items, or less frequently used products rather than reorganizing, purging or recycling them. Here are a few helpful tips on making your kitchen more efficient. By reevaluating items that may no longer be useful, and better organizing the ones that are, you’ll end up with a more efficient workspace that will ultimately make food preparation easier. I’ve become much more eco friendly by bringing my own cloth bags to the grocery store. But, occasionally, I forget to bring them along and have to settle for the plastic store bags. Rather than toss them once I get home, I do try to reuse them. But, those bags can accumulate over time and take over a drawer in the kitchen or even random space under the sink. There are a number of storage containers available today, designed just for these bags, that can be mounted to the inside of a cabinet door. Having this dedicated spot will definitely clear up other space in your kitchen. Additionally, smaller trash cans have been designed exclusively for these bags. So, rather than buying trash bags, these grocery bags are a perfect replacement. These “check out” bags and the produce bags are also great for cleaning up after the family pet when they are on their daily walks or for cleaning the litter box. If you don’t have pets, you might also consider passing these on to pet owners who may need a few more. Drawers are often filled with dishtowels. Rather than dedicating a drawer, consider getting racks designed to hang over a cabinet door. There are a variety of different types but many are specifically designed for dishtowel and potholder storage. By hanging these on the door, you can access towels more quickly during the cooking process. One of the biggest problems with kitchen storage is the number of disposable containers that we seem to amass in our kitchens. Many of these containers are often missing a top. The first thing to do is round them all up and match as many as possible. Then, recycle the ones without mates. You’d be surprised how much space you’ll get back in your kitchen. If you are looking for additional uses for the unmatched items, consider using the containers for open storage in a garage, workroom or woodshop. Simply attach them to a wall and you have instant storage. One additional use for small containers is to freeze fruit punch in them and then unmold the fruit punch “ice cube” into a punch bowl and add chilled liquids. This is an easy way to keep punch cold without watering it down. I have a number of cookbooks but, truthfully, I don’t use them very often anymore. I am much more likely to look at recipes and ideas on the Internet. Cookbooks can take up a lot of space in a kitchen. You could keep a few that you actually still use and recycle the rest to charities or to family and friends. Also, when are you using a cookbook, consider using an above the counter storage rack that allows you to read the instructions but also free up counter space for food preparation. There are a number of under the cabinet mounted cookbook holders that make a great addition to a kitchen. Also, because I do use the Internet to review recipes, I sometimes will forward the information to an electronic device, like a smart phone or tablet and simply place that device in the cookbook holder as well. I have a large number of pots and saucepans in my kitchen. Almost all have a matching lid. Rather than piling them up in a drawer, I put them in a simple rack made from two wood pieces that form the base and a number of dowel rods that create the separate compartments for each lid. These racks are very inexpensive. But, if you are handy with a saw and a drill, they are quite easy and very inexpensive to create at home as well. I created one for my lids with surplus materials I already had on hand. I’m a big collector of gadgets and interesting kitchen utensils. Sadly, though, I don’t always use them the way I thought I might. Over time, I can end up with a very messy drawer full of these gadgets. A very simple purging technique is to take every gadget and utensil in your kitchen and put it in a temporary box. Then, take items as you need them for your food preparation and store them in a separate dedicated place for the tools you are actually using. At the end of a year, if there is anything that you haven’t used, it’s probably not worth keeping. Recycle it by donating it to an organization that can use it or to a family member or friend who might find it useful as well. Also, rather than keeping all your tools in a drawer, consider a large open container that can be placed on your kitchen counter top or prep station. Having the tools nearby is much more efficient and removing them from a drawer opens up more storage. Many a drawer is filled with an assortment of restaurant delivery menus. A simple way to keep them organized and open up space in that drawer is to use a school or office style divider folder. These will usually have sectioned off flaps or pockets. Use these sections to divide your menus by food type. When you’ve filed them all, you’ll easily be able to select the type of food you’d like to order for the evening. One of the biggest mysteries in most kitchens is the content of the freezer. We often put items in there and then promptly forget about them. Take a moment to go through everything in your freezer. If you can’t identify it, there’s a good chance you’ll probably never eat it. If it’s been in there for over a year, there’s a good chance you won’t want that either. Clear out foods you can’t identify. They are just filling space that could be useful to you. Thanks to some of my Facebook friends, Ann Cook, Ida Waterous, Patty Strahan, and Angela Kordik for their ideas and suggestions that were included in this segment.